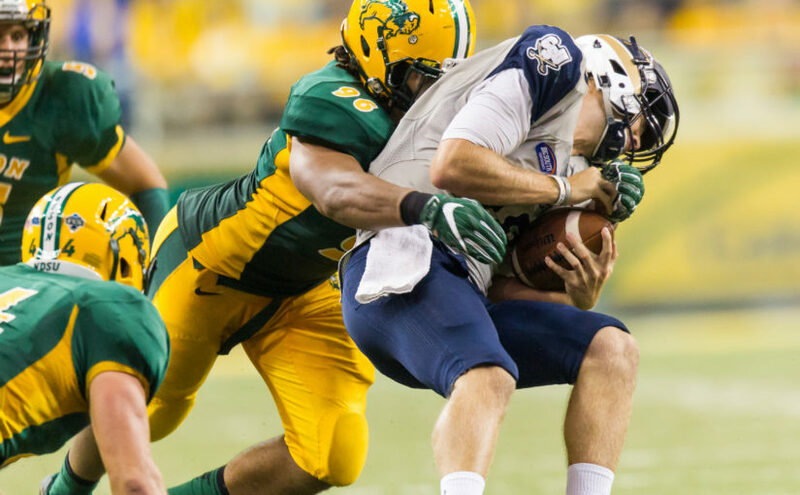 It’s safe to say year four at North Dakota State did not go to plan for Greg Menard. Heading into the 2017 campaign, Menard figured to be a key piece of a star-studded defensive group. However, on a nondescript sequence in an early August practice, the true senior felt his right leg move unlike it ever had in the past. Despite appearing innocuous, later evaluation confirmed Menard’s assessment of the situation and gave a dire outlook: a torn ACL would end his season before it had even started. What was unclear, however, was whether or not Menard would make use of the last year of eligibility. Looking at Menard now, it’s impossible to consider that was ever on the table. Over a year removed from his injury, the Lakeville, Minnesota native is “a full go” for Saturday’s home opener against Cal Poly. Menard’s distinction as a redshirt senior is unorthodox, but he returns to a pass rush that could be seeking veteran leadership. Menard will fill a critical role disrupting the backfield — something he and the rest of the Bison’s front seven will seek to do all season. Even with losses, depth along the defensive line will once again be a strength for defensive coordinator Matt Entz and NDSU. Fellow seniors Caleb Butler and Stanley Butler figure to share the lion’s share of the snaps on the edge, but returning players Logan McCormick and Derrek Tuszka will also factor into Entz’s schemes. In short, “We don’t want to be guys who are there eating up blocks. We want to be guys who are in the backfield creating havoc,” Menard said. Creating havoc behind the line of scrimmage has been a staple of Menard’s game since he burst onto the scene in 2013. In addition to 28 career sacks, he has also logged 42 tackles for loss, establishing himself as a key disruptive force for years. Menard’s 6-foot-2-inch frame puts him on the smaller side for collegiate defensive ends, but he uses it to out-leverage opposing linemen. “I’m not the tallest guy who plays defensive end. I can use that a lot to get under the offensive lineman’s pads and stay low, make him have to bend to block me,” he explained. Against road-grading blockers in the Missouri Valley, Menard possesses an unstoppable advantage, which he used to tally double-digit sacks in his past two seasons. That, along with quick-twitch instincts, makes Menard one of the toughest blocking assignments in the FCS. In spite of missing the entirety of 2017, the senior earned a nomination to the Buck Buchanan Award watch list for 2018 and a preseason nod to the All-Missouri Valley First Team. Immediately on the horizon for NDSU is this Saturday’s home opener against Cal Poly. The Mustangs’ triple option poses a unique challenge, but not one with which the Bison are unfamiliar. The Herd took down Wofford’s triple option in the playoffs just a season ago. Still, it is a difficult system to simulate with the practice squad and understand the impact it has on a defense. Menard isn’t expecting to pick up any sacks against Cal Poly, but he and NDSU’s front seven still plan to cause mayhem behind the line. After that, sacks are certain to pile up for the two-time All-MVFC First Team honoree. By the time the regular season is completed, Menard will be nearly finished with the final class to complete his civil engineering degree. After that, Menard plans to let the chips fall where they may. The first step is a burst out of the tunnel Sept. 1, the conclusion of a 624-day odyssey since his last game action before the ACL tear. Where it ends is in Greg Menard’s hands; the final chapter still to be written.